Deciding what the best herbs for symptoms of colds and other viral infections, can be a combination of trial-and-error. Traditional remedies have been passed down from generations of our families, and they often end up to be everyone's favorites. The common cold is the most frequent infection in humans. And, it is very contagious, causing respiratory complications. If there were a cure, we'd all be lined up for it, but there is no cure for common colds. And, it just keeps getting passed along by virtue of being in the same place and breathing the same air, as well as touching things with those with the infection. Try as we might, it can be unavoidable, especially if you have children in school. This herbal formula contains expectorant herbs to help thin and expel mucus that congest the air passages. It also contains demulcent agents which contain mucilage to soothe dry, irritated tissues, they are specific for a sore throat or a dry cough. Honey has been used for centuries to reduce nighttime coughing and to improve sleep. In fact, in a study, honey appeared to be as effective as a common suppressant ingredient. Honey can be a part of a supportive care regimen for children's colds, and may even help to improve their sleep. However, it is believed that it is not appropriate for children younger than 1 year of age because they are at risk for infant botulism. Skip the honey, and call your health practitioner if there is also: Fever, prolonged, and worsening cough, wheezing, and symptoms that last longer than two weeks. Wild Cherry Bark, or Prunus serotina, is considered to be an excellent herb for calming down those wild, unwieldy coughs. It's the inner bark that is used for cough medicines and is often found in conventional medicine as well. Wild Cherry bark has expectorant qualities and is helpful for a dry cough, and for soothing sore throats. It has been used as the main ingredient in natural cough syrups since the Native Americans introduced its bark to migrating settlers. Wild Cherry Bark extract is not recommended for those who are pregnant or nursing, or for young children. The herb can be toxic in large doses and is normally taken in cough syrup or as an herbal tea. Cubeb Berries have been shown to be effective in easing the symptoms of chronic bronchial disorders, and it has a stimulating effect on the mucous membranes of the respiratory tract. Cubeb extract is considered to be a fine expectorant that helps to loosen and expel excess phlegm and mucus, as well as it relieves a cough, laryngitis, pharyngitis, hay fever, dry cough, sinusitis and asthma symptoms. Mullein has been valued as a superior medicinal herb, and used by the Greeks, for diseases of the lungs, and has remained in use for more than 1,800 years. The leaves of Mullein are considered have anti-inflammatory, antispasmodic, expectorant and astringent properties, and has been found to be very useful for dry, irritated lung conditions or a dry, raspy throat.These qualities also encourage secretions in dry mucous membranes. 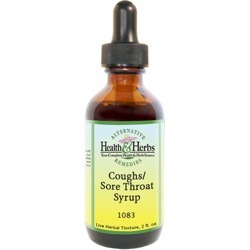 It works naturally to soothe chronic bronchial complaints and relieves throat inflammation and irritation and helps control coughing in croup (a barking cough) and those that accompany a cold or flu. Western Skunk Cabbage, has also been called Swamp Cabbage, and Yellow Skunk Cabbage, has been used by Native Americans as medicine for burns and injuries, as well as for sores and swelling. It contains calcium oxalate crystals, and has been used historically, primarily as an expectorant, and helpful for whooping cough, bronchitis, and asthma symptoms. Today, it is still used as an expectorant for relieving upper respiratory problems, such as nasal congestion and hay fever. Clove bud extract is native to Indonesia and used as a medicinal remedy for a toothache, bad breath, and cough. Cloves are commonly used to reduce the irritation of the throat, asthma symptoms, chronic cough, joint pains, headache, and toothaches. The health benefits of Clove bud extract can be attributed to it antimicrobial, antispasmodic, carminative, expectorant, antiseptic and stimulant properties. Peppermint leaf has had a long tradition of medicinal use dating back thousands of years. Most often it has been used to soothe an upset stomach, heartburn and to aid in digestion. Because it has a numbing and calming effect, it has been used for headaches, nausea, diarrhea, flatulence, anxiety and menstrual cramps. Do not give Peppermint to an infant or small child as it is known to cause life-threatening breathing problems. Ingredients: Raw Manuka Honey, Wild Cherry Bark, Cubeb Berry, Mullein Leaf, Skunk Cabbage Root, Essential oil of Clove, Essential oil of Peppermint, Structured Water and 5% Alcohol. Instructions: Use 6 to 30 drops in juice, water, under the tongue or as desired. May be taken 3 times daily. Shake well. Store in a cool, dark place. Keep out of reach of children.